In this tutorial you will use SYD to create a patch which will simulate the sound of a large BELL. Using Additive Synthesis techniques. As a background to understand the procedure outlined below, you should read Bell Characteristics. To synthesize a bell using the application SYD, you will need to add 11 operators: the fundamental frequency (1 operator), 8 separate s (8 operators), an amplitude envelope (1 operator) and a mixer operator (1 operator). 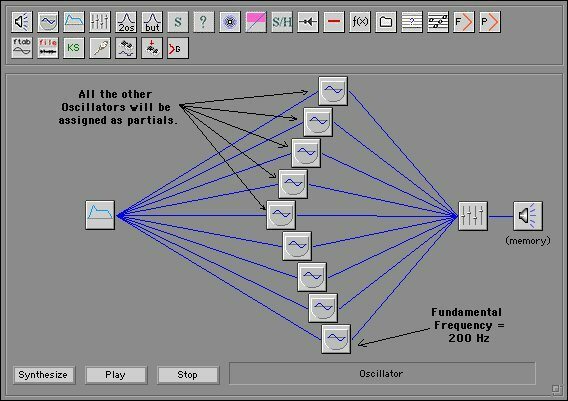 If you have not already done so, please read, Additive Synthesis. Technically, a PARTIAL is a frequency in the spectrum of a sound which is NOT in the Natural Harmonic Series. Sometimes it is also called a "detuned harmonic" or an "enharmonic." In the chart above, the frequencies that ARE part of the Natural Harmonic Series are represented by whole numbers (2, 3). All the other frequencies are PARTIALS. Often in a bell sound, the true FUNDAMENTAL is MISSING altogether or a SUBHARMONIC is hear (perceived) by the listener instead. The lowest frequency here (the 1st wave) is a SUBHARMONIC; the 2nd frequency is close enough to the Fundamental of the Natural Harmonic Series to be considered a detuned partial. The Fundamental Frequency of the Bell should be 200 Hz. Please assign the Oscillator Operator at the BOTTOM of the SYD window to the Fundamental Frequency. All the other Oscillator Operators will be assigned as partials. 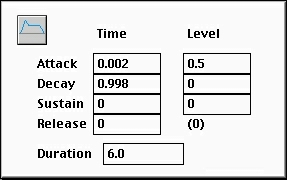 Continue setting the frequency ratios of the remaining operators according to the table listed in Figure 1 above. When you have finished, click the SYNTHESIZE button in the bottom left corner of the patch window. Then click PLAY to listen to the sound. In this Simple Bell patch, all the partials have the same amplitude provided by the LEVEL setting in the Amplitude Envelope. A better scenario would be to have separate amplitudes for each partial such that the FUNDAMENTAL has the loudest amplitude (.5), the 1st partial is 50% of the amplitude of the FUNDAMENTAL (.25), the 2nd partial is 50% of the amplitude of the 1st partial (.125)...... and so on until you finish all 8 partials. This follows the SPECTRUM of the NATURAL HARMONIC SERIES where the amplitude of each harmonic is inversely proportional to its position in the series. Experiment with different ways to efficiently set these amplitudes. Experiment with different ways to efficiently set separate times for the amplitude envelopes of the various partials. For example, try experimenting with the FUNCTION operator and the EXPRESSION operator. 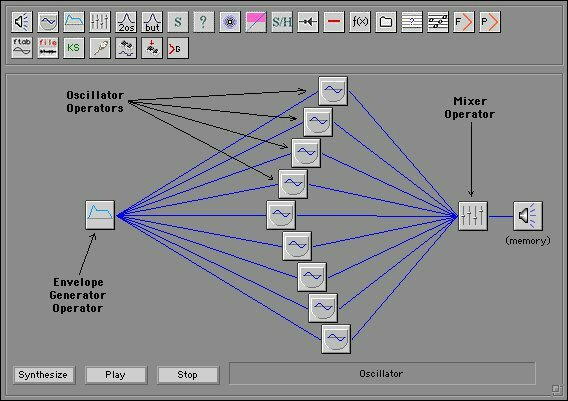 Using these operators, you can pass an EXPRESSION to ALL the amplitude fields simultaneously. In a REAL bell, one side of the bell may not be cast to the same thickness as the other side. Consequently, there will be mall variations in frequencies which produce BEATING at various frequencies. Experiment with using pairs of slightly detuned operators ("enharmonic" partials) to simulate this BEATING effect. Further information on SYNTHESIZING BELLS can be found on the Sound On Sound: Synth Secrets site: Synthesizing Bells. If you have not already done so, please read Bell Characteristics.